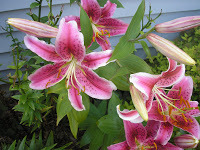 This is a photo of my Aunt Emily showing off her Stargazer Lilies. She was one of my favorite people in the whole world. 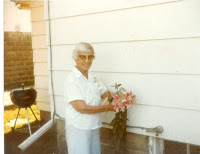 Aunt Emily died in 1994 at the age of 98. Yes, 98. She also only lived in a nursing home the last year or two of her life! She was amazing! I loved going to visit her as a child and later as an adult. She was the tiniest little lady I had ever seen, but she was a tough little lady! I remember going and visiting her later in her life in her tiny senior apartment. We would have lunch together and read or watch TV. Aunt Emily also kept a daily diary and I always thought I would do that too. I guess my blog is as close as I will get for now. 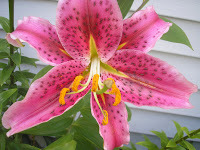 Every year I am reminded of my Aunt Emily when my Stargazer Lilies start to open. Their scent is so powerful that it instantly takes me back to Aunt Emily’s house and reminds me of her. 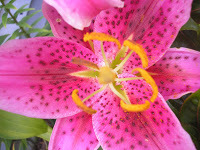 I miss her terribly, but am so glad I have my stargazers to remind me of her!